The City or Morioka is nestled in a broad plain below Mount Iwate-san (background right) in the central part of Iwate district. The 2000 meter mountain and surrounding hills feed two rivers, the Kitakami-gawa and the Nakatsu-gawa that, along with the lush green surroundings, lend the city an ambiance that is unsurpassable. The above photo (click to open), along with that of several wildflowers (linked photo album), were taken after Lynn and I climbed Poet’s Walk behind the home of our first host family, Rieko and Yoichi Sakashita. The photo albums attached to this story have been placed on an open Facebook Page and are available to everyone regardless of whether they have a Facebook account. While the pictures will tell much of the story, the following notes provide a general outline of our travels of our two week visit. As Wi-Fi access and preparation time was limited, the notes being presented below are compiled from earlier Facebook posts to family and friends. 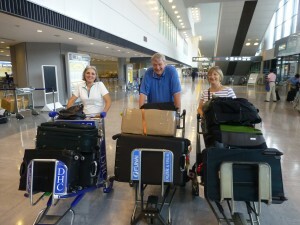 Photo: Rita, Bill and Lynn push the carts with our ample supply of luggage. It may have seemed like overkill for four people, however, four large suitcases contained gifts and other supplies, much of which was destined for school children and sports groups along the East Coast. We are certainly grateful to our friends, Bill and Rita McCreadie, for inviting us on the journey and who led the way from Canada. They shepherded us through our arrival at Narita and onto the shuttle train that would connect us to the Bullet Train for that speedy ride Morioka. The transfers were managed with such ease that we could well have been out for dinner and movie in our home city of Victoria. 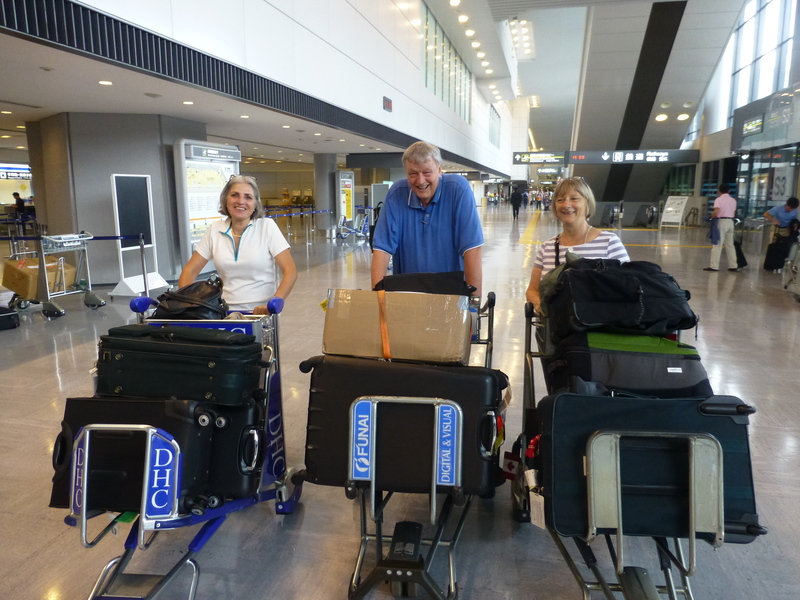 As you might have guessed, the McCreadie’s have taken this trip many times before and we could not have ask for better travelling companions. From the moment we set foot in Japan, everyone has been so gracious and seem intent on introducing us to every aspect of life that is possible in the short time we will be here — their homes, gardens and shops; the city and country; participating in their cultural celebrations and attending their schools and sporting events. It would be difficult to find a more welcoming people. Another thing that becomes quickly evident – Japan is bathed in lush green, from the hillsides to the valleys, in a fullness that rivals any of the scenic displays Canada has to offer. 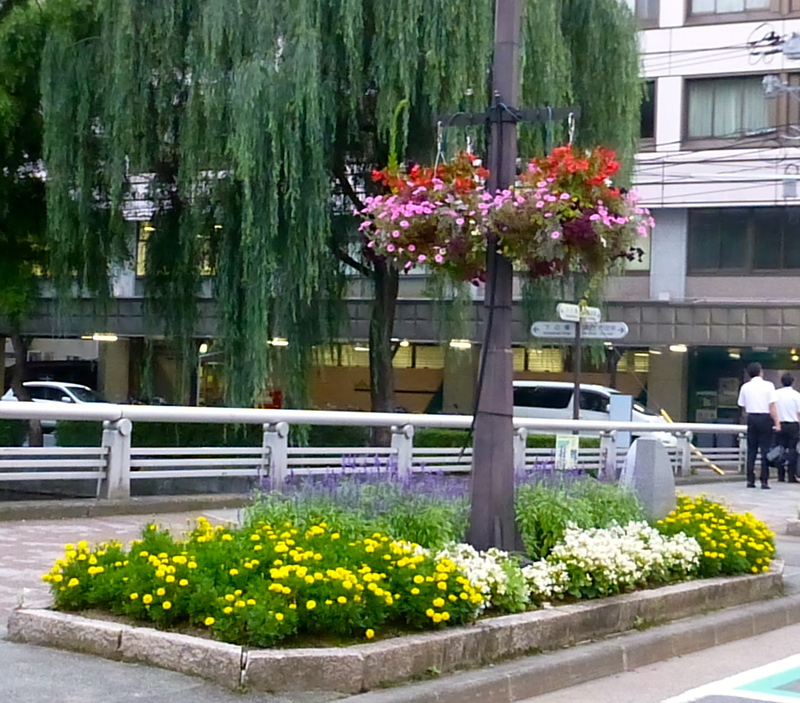 It is also amazing that only ten years after being introduced to the art of building hanging baskets, Morioka has now surpassed the number on display in our home city of Victoria. Morioka, however, has taken a slightly different path. They began by introducing the art of basket making to a number of volunteers who in turn passed along the skill to others. Each basket you see displayed on a street or outside a business, was built and placed by there by an individual or business. That individual or business is also responsible for tending the basket during the summer months and if they are away for a week-end or holiday, must appoint someone to tend their basket. Nurturing this spirit of community co-operation is something well worthwhile emulating. In Victoria, we are far more dependant upon government to carry out these beautification tasks. Our daily travels are also interspersed with an endless supply of delicious foods of which we have been partaking most freely. There is little doubt that by the time we return to Canada we will be setting a few weight loss goals. Another custom and one that is new to Lynn and I in our travels, is the frequent exchange of gifts. It is certainly a good thing that, under the careful guidance of Rita, we have come well prepared. In regard to gift giving, we have been treated most kindly by our hosts and it seems we shall end up returning with more packages that we brought. Morioka, as many of you may know, is the sister city of Victoria and is very similar in size at about 300,000. Bill and Rita have been an important part of this cultural exchange for over 25 years and have made friendships that will last a lifetime. While Lynn and I are new to the Japan end, on previous visits by the Japanese to Victoria, we have hosted several of the people a few of whom we are now again meeting on this trip. Although the climate is similar to Victoria, Morioka, tends to be a bit warmer in the summer and a bit cooler in the winter. Snow can pile several feet high in the nearby hills and on Mount Iwate (2,038 meters) so skiing is a favourite winter pastime. We have been told this past July was filled with heavy rains that just stopped the day of our arrival. Perhaps that was just part of the day- by-day planning by our most energetic hosts? 2. Welcome to Morioka and Introduction to the Sansa Festival. Our first morning was filled with welcomes which began with a courtesy call to Mayor Tanifuji and Chairman Murata at the Morioka City Hall. This was followed by an unveiling ceremony at the Morioka History and Cultural Museum of a hand-carved, cedar bench donated to the City of Morioka by Bill and Rita as a personal gift. The beautiful bench was designed and carved in Victoria by a local artist, Alex Rogalsky, then surface shipped to Japan well ahead of our visit. Later that afternoon, we were again welcomed to City Hall by Ko Hosokawa, of the Community Affairs Department, who introduced us to other staff members and visitors as final preparations were made for the opening of the Sansa Odori Festival. It was clear from the number of City Hall staffers and visitors involved the planning that the Festival is a yearly highlight for Morioka. 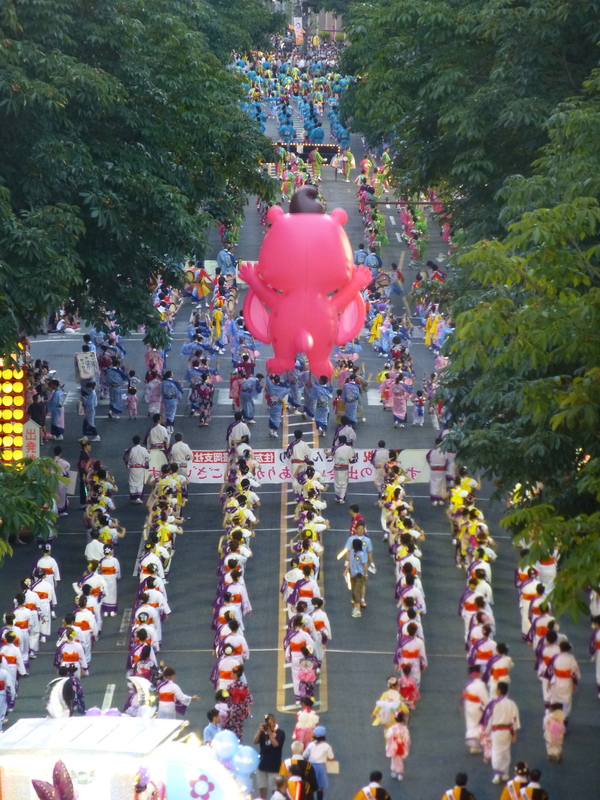 It was great news for the festival that the annual July rains finally subsided as the Sansa Odori festival is largest drum parade in the world and the festival, along with dozens of other events, would be the focus of city affairs for the next three full days. During the lead-up and presentation of these events, thousands of people descend upon the city to watch the 10,000 plus Taiko Drummers and Dancers make their way along the main street from city hall. All day and into late evening the celebrations continue as young and old from all over Japan continue to wear their colourful costumes. It was only our first day in Japan and the pace seemed likely to continue for the next thirteen. After second night of most welcome sleep, we spend our first casual morning getting to know our hosts, Rieko and Yoichi Sahashita whose beautiful hillside home, nestled among the trees, is so reminiscent of our own home in Victoria. The difference between the two, home in which we are now living has many features that is traditional Japanese. Our bedroom has bamboo sliding doors overlooking a forest of trees. Many would recognize the setting after having watched from any of several North American made, Japanese movies. Before heading to bed, we folded out the most comfortable folding mats that on all counts beat our Canadian blow-up mattresses and, guess what, no leaks in these mats. Although I have not included a picture, we were each provided with traditional night attire that imparted a total feeling of living in a Japanese home. While at home we both experience bouts of insomnia, in Japan we slept like proverbial babies, but oversleeping was not on the agenda (and, of course, not wanted), we were soon off and running to our next series of events. Another amenity we both loved was the combined shower/bath, a complete room in which the walls and floors were tiled and the bath could be taken while standing for sitting. After a sumptious breakfast, we managed to find time to fit in a walk in the hills behind the Sakashita’s home. 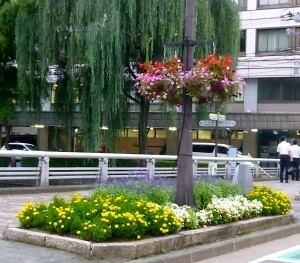 The pictures of Morioka, the wildflowers and Poet’s Walk are all a stones throw from their home. Later that morning, we were dropped off at the Morioka where we were met who has been deeply involved in the Morioka-Victoria Society for many years, Kansai-san. It would be the first time any of us had attended Sumo Wrestling event and in Japan, Sumo wrestlers are held in the highest regard, and stand among the most revered of sports heroes. Following the event Kansai-san ushered us off to his favourite sushi restaurant for a quick afternoon meal before hustling us back for a quick nap before the evening meal which, in this case was with Japan’s reigning Sumo Wrestling Champion, the Mongolian born Harumafui. Harumafui captured the Emperor’s Cup at the annual New Years tournament earlier this year and will hold the title until the next champion is named in 2014. It seems that the Japanese Sumo Wrestling champions for the past seven years have arrived from outside Japan. Given that Sumo Wrestling is on par with Hockey Night in Canada, this must be a bit of a thorn in the side of the Japanese. Canadians generally have the same feeling when those pesky Russians or Swedes manage to grab the International U20 Title. 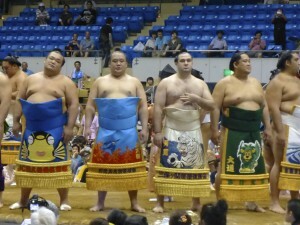 Photo: As you see, Sumo Wrestlers come from a various countries around the world. One thing they have in common is a very substantial girth (more photos in the linked file). Later that evening as we sit around the floor level table for our late evening meal, it is clear these young men can put away a ton of food. When someone asked the champion how many regular sized bowls of rice he might eat at one sitting, he stated: “Perhaps thirty-five.” Given there were eighteen young wrestlers present, a substantial amount of rice, along with other side dishes, was in plentiful supply. We even learned later that after the team returned to their hotel, they had another late (late) evening meal. Well, that provides a synopsis of our second full day in Japan and it seems that even in this lush country, no grass is about to grow under our feet. If this pace continues our lives shall certainly be filled with many new and exciting adventures over the next several days. Our starting point on most days was the new wing of the JR Hotel Metropolitan in downtown Morioka. That is where Bill and Rita had staked out a claim on one rather fine room. As part of our reason for our being in Morioka was to arrange for the purchase of soccer equipment and musical instruments for kids whose lives had been so devastated by the 2011 Tsunami, we were soon invited to participate in several soccer events and meetings. 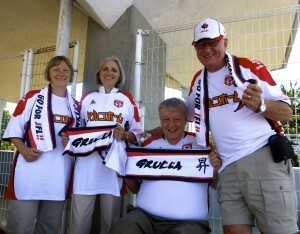 On this day our first stop was a Grulla Soccer Club match, the Grulla being a top-level team in Morioka. The team was currently in second place in their division and looking to capture first place and promotion to the J3 (Japan League, 3rd division). The entire city is rooting for them as was evidenced by number of support signs in the local clubs and pubs. Before leaving the hotel, we were presented with Grulla Jerseys and once at the stadium, interviewed by a local newspaper about our interests in soccer. It seems many were well aware that for many years Bill and I, along with our wives, had been heavily involved in organizing soccer teams and events in Canada. Ah, boxed lunches, beer and friends. it was good to again feel the glow that participating in soccer can bring. That glow was given a little jolt when nearing half time the stadium began to give a good shiver as a 5.5 earthquake rolled through the area. Although it lasted well under a minute, any earthquake in this area draws close attention of the population. Earthquake notwithstanding, Grulla went on to handily win their match and seem on track for promoted to the J3. The final three games of the season will tell the tale. During the post game introductions, as in later soccer meetings (particularly at one pub night), it was as if we were back in Canada. 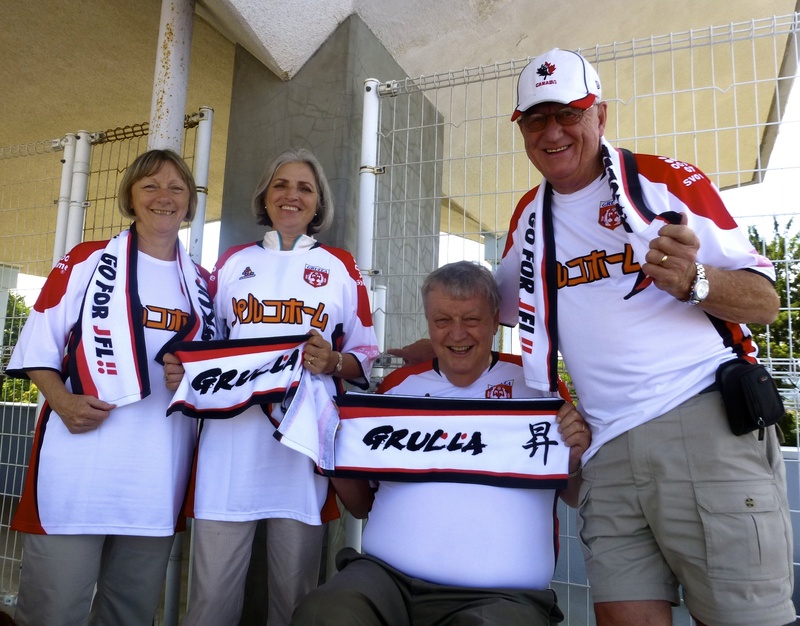 While discussing the pros and cons of soccer organizations, teams and tactics, it soon became evident that many of the ups and downs that define Canadian’s national soccer team aspirations, are part and parcel of soccer life in Japan. It is good to know we are not alone as we strive to put our men’s team on the National same stage as our Women. Oh, one another subject. Several of the soccer people asked about Dante Zanata, as it seems he and his wife made quite a splash the last time they visited with a team. Hopefully, we were successful in encouraging one of the top tier teams to make the trek to Victoria in order to challenge Zanata. Later that afternoon, we were scheduled to catch the Bullet Train for a quick trip to northern city of Aomori for the Nebuta Festival, however the earthquake a few hours earlier had put the kibosh on the plan as the train would not again run until the track were certified safe. Not to worry, in true Japanese style, our hosts soon secured use of the Metropolitan Hotel bus and an hour later our group of nine were merrily on our way for the three-hour drive to Aomori, also a city of similar size to Victoria. 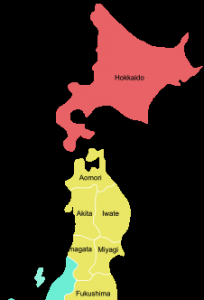 The surrounding Prefecture, also named Aomori, covers the entire northern tip of Japan and, along with Iwate (on the east) and Akita (on the west) Prefectures, is the area in which most of our Japan travels took place. These far northern Prefectures, along with the northern Island of Hokkaido, make up the least populated areas of a nation. In Aomori, the Nebuta Festival is another of the many four-day city festivals that flourish across Japan during the summer months. Many involve drums and drum teams and while Sansa Odori also involved drum teams, dance routines were the main focus. 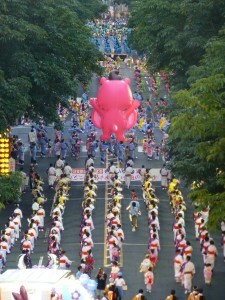 The Nebuta festival hosts hundreds of floats, each of which is sponsored by local business or family, with each float representative of a brave warrior. On the last day of the parade (we did not attend) the floats are set out in the Bay of Aomori while thousands of fireworks illuminate the Bay. As I understand the tradition, while it must take many weeks to construct and paint these elaborate, colourful floats, only four or five of the best are preserved for the following year. The remainder is cast off to sea during a gigantic fireworks display. Another interesting facet of the city is the number of Americans. There is a large USAF Airbase nearby so the presence of US Military personnel in the downtown core is evident as young airmen spend the evenings with their dates in the pubs and restaurants. While thus far on our trip we have seldom run into many Canadian or American tourists, that certainly changed in Aomori. In the local Japanese Restaurant (the English name is Tony Roma’s, of course) the mix was nearly fifty-fifty. All those shinning, young faces of USAF personnel with their close-cropped, sun bleached hair, gave a distinctly north American ambiance. I cannot help but imagine the young Japanese men in this area were not overly thrilled to see so many Japanese woman, many in traditional dress for the parade, on the arm of a US serviceman. I know how I felt when in high school and living near the large Royal Canadian Air Force base at Cold Lake (Alberta) and all those young airmen were waiting in line to take out “our” girls. Well, on this day in Aomori, it was not a problem for us as we four men already had four good-looking women in tow. 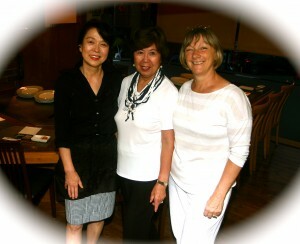 Photo: Three of our dates (the fourth had stepped out for a moment). All four certainly attracted the attention of those single servicemen who were without dates. Tough luck fellas – spoken for. After another great meal, we made our way through the celebrations to our reserved seats (at most parades, seats are reserved well in advance) and settled in for another amazing festival. This time dozens of heavy floats, many balanced on two wheels in a manner that allowed them to tilt from side to side, were zigzagging down the street. Powered by a dozen or more men (depending on the size of the float), on occasion it seemed as if an incoming giant warrior might crash into the crowd. Japan is most certainly a country that defines much of their cultural heritage in the festivals that fill the entire year. By 9:00 pm, we were on our way home and tucked in bed by 12:30 am. It was another long day, but after sharing so many new colours, sites and sounds with friends, it was impossible to feel tired. But, sleep we must as we had to be up bright and early for another bus trip. This time we are headed to the East Coast and the area so devastated by the 2011 earthquake and tsunami. This trip represents a good portion of our reason for having travelled to Japan. 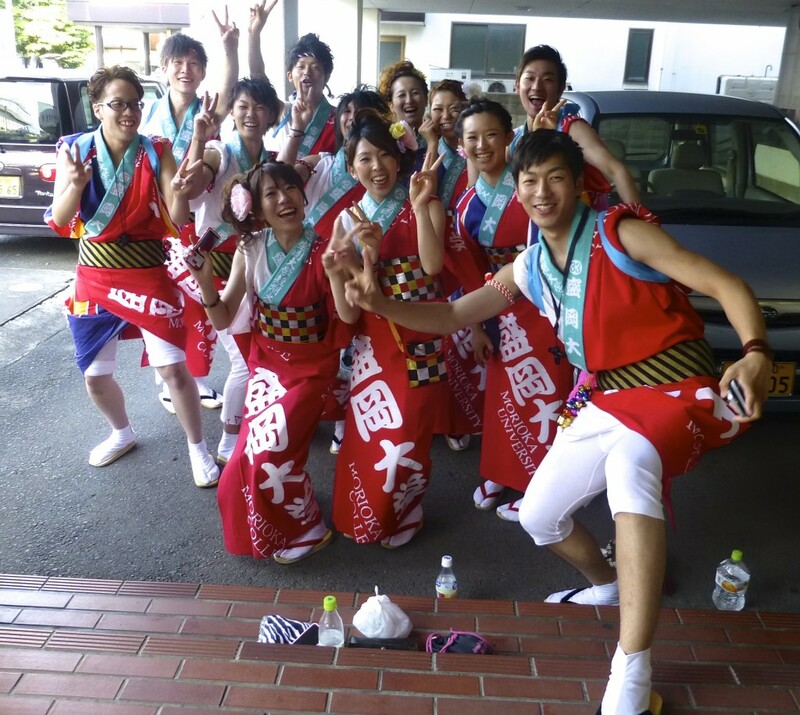 Photo (below): Morioka: I managed to capture this group of young people as they were leaving their hotel. All across Japan, people were more than will to stop and pose for a photo. The standing job that developed within our group of friends and acquaintances were the words (after the first photo was snapped) “Just one more” as the photographer held up his or her index finger.